Earlier this month at the World Urban Forum, the Lincoln Institute of Land Policy announced the publication of Planet of Cities (now available for pre-order from the Lincoln Institute and Amazon). This post is a modified excerpt from the second chapter – The Inevitable Expansion Proposition. The Queens Majesty perceiving the State of the City of London (being anciently termed her Chamber) and the Suburbs and Confines thereof to encrease daily by Access of People to inhabit in the same . . . Her Majesty, by good and deliberate Advice of her Council . . . Doth charge and straitly command all Persons of what Quality soever they be, to desist and forbear from any new Buildings of any new House or Tenement within three Miles of any of the Gates of the said City, to serve for Habitation or Lodging for any Person, where no former House hath been known to have been in Memory of such as are now living. The official reasons for issuing the queen’s proclamation are eminently sensible and not unfamiliar to the modern reader: an influx of poor and unskilled people; inconveniences caused by congestion; price inflation caused by increasing demand; the dangers to public health caused by overcrowding; unfair competition by newcomers flooding markets with cheaper goods of compromised quality; and claims “that the City could scarcely be well governed, by reason of such Multitudes flocking to live there.” Official consternation with the unruly multitudes crowding into theaters to enjoy Shakespeare’s plays in those years would surely have resulted in a ban on theaters as well, but for the queen’s fondness for this form of entertainment and the fact that theaters were built in the suburbs outside the city’s jurisdiction to make sure they were not closed down by the authorities. The population of London in 1545 was almost 70,000 (Russell 1948). It was increasing rapidly, particularly after the destruction of Antwerp by the Spanish in 1572, which left London as the largest port in the North Atlantic at a time of rapid expansion of global trade brought about by the onset of colonization. In 1572, London occupied an area of 3 square kilometers (km2). Two-thirds of the area was within the city’s walls and one-third in its growing suburbs. By 1650, it was estimated that only 120,000 people lived in the city proper while 300,000 lived in the surrounding suburbs outside the city’s jurisdiction. John Strype, the chronicler of the events surrounding the queen’s proclamation, notes, “This Proclamation could not hinder this strong Propension in the People towards building new Houses.” Other proclamations followed, to no avail. “Between 1602 and 1630, no fewer than fourteen proclamations were enacted in attempts to limit London’s growth” (Lai 1988, 28). The population of the city increased to 500,000 by 1674, to 675,000 by 1750, and to 959,000 by 1800. By 1860 the population of London was 2.76 million, by 1929 it was 8.0 million, and by 2000 the population of Greater London exceeded 10 million. During the 200 years between 1800 and 2000, the population of London grew more than tenfold, from 1 million to 10 million, but its built-up area grew much faster. In fact, it grew sixty-three-fold, from 3,600 hectares (36 km2) to 230,000 hectares (2,300 km2). 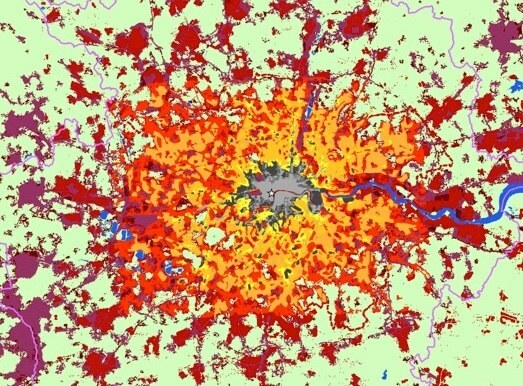 Neither London’s population growth rate nor its rate of physical expansion were atypical. Queen Elizabeth’s noble attempts to contain the growth of London are now more than 400 years old, and their utter and obvious failure should have alerted us to the futility of such attempts.